“Fragrance” is defined by the FDA as a combination of chemicals that gives each product its distinct scent, however, cosmetic companies are not required to disclose what ingredients are used to make that fragrance. Most fragrances are derived from petroleum and chemical compounds that mimic natural aromas, as well as solvents, stabilizers, UV-absorbers, preservatives, and dyes. And the sad truth is that many of these chemical components have been found to contribute to health concerns such as migraines, asthma, gastrointestinal issues, cardiovascular problems, and cancer. The International Fragrance Association (IFRA) lists 3,059 materials that are reported as being used in fragrance compounds and of these, very few have been tested for toxic effects on the body. Jordan Essentials feels that our customers should enjoy the best of both worlds! Our products not only have delightful scents that are hugely popular, each fragrance is carefully sourced and tested to ensure all compounds and components are nontoxic to the body. Many JE products are available in unscented varieties. Our unscented products are popular for many reasons. First, for anyone who is sensitive to fragrances of any kind, or just wants the benefits of the product without any additional scent, the Unscented Varieties work great! Second, for those who like to customize their own fragrances using Essential Oils they can easily add them to the unscented varieties, making their own unique blend to fit their mood or needs. Products such as the Magnesium Dead Sea Salt Soak, Jordan Essentials Salt Scrub, and Jordan Essentials Foaming Hand Soap are a few customer favorites in unscented option ready to customize. Phthalates are chemicals found in many cosmetics that are used as a stabilizer, the most common being diethylphthalate (DEP). The FDA website states, “It’s not clear what effect, if any, phthalates have on human health.” (seen here) The Center for Disease Control (CDC) has a similar statement on their website regarding phthalates. However, other countries post numerous warnings about these chemicals, particularly when using in baby or infant care products, from their governmental agencies due to independent studies linking overexposure of phthalates to health concerns such as endocrine disruption, developmental and reproductive toxicity, and cancer (source). Some Jordan Essentials products do use a synthetic “fragrance” as one ingredient, such as the popular Oatmeal, Milk, & Honey, Black Raspberry Vanilla, and Sea Spa. Unlike many products on the market, the fragrance used in Jordan Essentials products does not contain any of those chemicals or components that could be deemed as potentially harmful. Even if the CDC and FDA states that there is no clear evidence that these ingredients may be harmful, we prefer to err on the side of caution and only provide the best for our customers. So you can enjoy all “fragrance” scented products with complete peace of mind. Unlike “fragrances” which are derived from man-made chemical compounds, essential oils are the concentrated essence of God-made ingredients. This may be from the leaves, roots, stems, seeds, flowers, or rind of various plants. Essential oils carry the natural constituents of that plant, providing both rich aroma and potential health benefits. Jordan Essentials uses essential oils and essential oil blends in many products to provide both the aroma and the potential healing qualities to the customer. You will find essential oils in JE products with Lavender & Eucalyptus, Jordan Essentials Baby, Resistance, Helio, Allergy, and all the Essential Oil collection products and blends. Sometimes Jordan Essentials will create an amazing and popular scent that combines man-made fragrance blends with God-made essential oil blends. Examples of this are the Spring/Summer 2019 fragrance choices of Grapefruit and Bergamot, and Cucumber Lemongrass. So the next time you raise a Jordan Essentials product to your nose and enjoy that delightful scent, you can rest assured that the ingredients used to make that product so enjoyable to the senses is not only nontoxic for your health, but may even be helping support your health in some ways as well! Use with confidence, knowing you are getting the best for your skin, so you can have Healthy Skin and a Healthy Life! 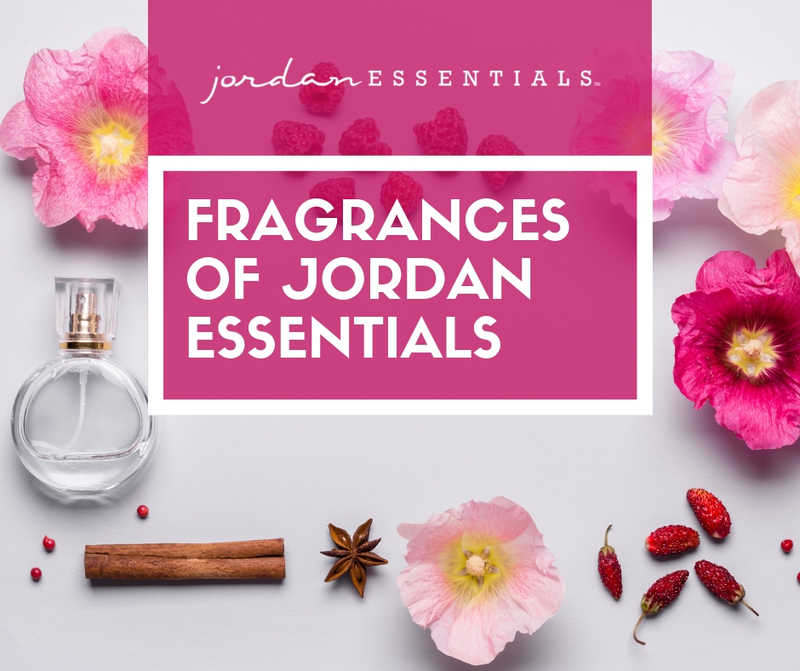 And remember, your Jordan Essentials Consultant is a valuable resource for you as you choose which option is best for you and your family: Unscented, Phthalate-Free Fragrance, Essential Oils, or a Fragrance/EO Blend. Comment below with your favorite Jordan Essentials fragrances and any you’d love to see in the future. For educational and entertainment purposes only. Jordan Essentials does not claim to diagnose, prevent, treat, or cure anything. Seek medical advice from a healthcare professional if needed. Not endorsed by the FDA.